What does an inclusive higher education provider look and feel like today? What will it be in the future? How do you achieve a truly inclusive student experience? AMOSSHE, The Student Services Organisation, in collaboration with De Montfort University, is hosting a continuing professional development day to consider these questions, with a specific focus on the experience of disabled students. ‘Universal design for learning' takes place on 8 December 2017 at the Holiday Inn Royal Victoria, Sheffield. The Disability Enhancement Programme at De Montfort University, which heavily informed the Department for Education guidance Inclusive teaching and learning in higher education as a route to excellence, outlines how one institution is achieving student inclusivity, for example through the application of a Universal Design for Learning framework. Using this programme as a focused case study, you’ll be invited to work collaboratively to develop specific models of what constitutes an inclusive institution for today and the future. This event is for Student Services professionals and academics leading work in Universal Design for Learning or inclusive practice. The day will be most beneficial if you encourage your academic and/or professional colleagues to attend, so that you can engage collaboratively. Find out more and book your place here: Universal design for learning. Here's the AMOSSHE quarterly bulletin for summer 2017: a roundup of AMOSSHE news, events, and more (click image to view - PDF 7.1 MB). This bulletin features a roundup of our summer conference, with photos of our successful event in Brighton. Also, find out about the new Student Services projects that AMOSSHE is funding in collaboration with Unite Students to explore how to develop student resilience in accommodation settings. Are you interested in joining AMOSSHE to make the most of our supportive network and resources and stay up-to-date with the latest developments in the student success sector? If so, find out about our new 2017/18 membership categories: we’re broadening the opportunities for people to join our network and contribute to good practice in this rapidly evolving sector. Every year six roles become available on the AMOSSHE Executive Committee, and members have the opportunity to nominate themselves to join the team. In 2017 roles became available to serve from 1 September 2017 to 31 August 2019. Five members nominated themselves for the four available Executive Member roles, which meant that the final candidates were chosen by a membership ballot. There was no competition for the available Vice Chair (Operations) and Vice Chair (Professional Development) roles, so these appointments didn't require a membership vote. 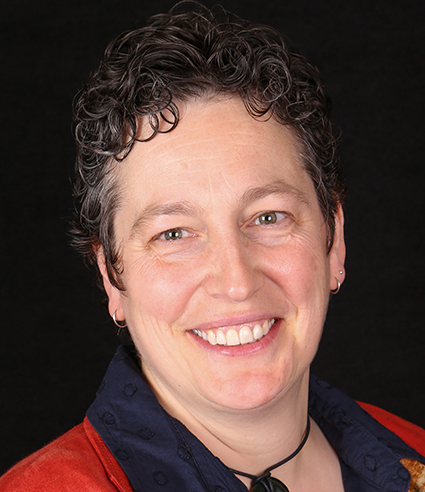 Jayne Aldridge (Director - Services for Students, Kingston University) takes the role of Vice Chair (Operations). Many thanks to Sam Dale (Deputy Academic Registrar, Durham University) and Christine Lowther (Director of Student Services, University of Glasgow), who leave the Executive Committee at the end of August. Here are the nomination statements from everyone who joins the AMOSSHE Executive for the 2017-19 term of office. These are a personal statements about their intentions and why they're right for the role. Having recently served on the Executive Committee I know how important a strong representative body is to the daily work of Student Services professionals. As part of a membership-led organisation I am committed to consulting with and listening to the views of members, to represent and help shape AMOSSHE’s priorities to ensure our organisation remains relevant to the day-to-day challenges that we face. Given the ever more complex and challenging policy environment within higher education, and most specifically for those of us empowering and championing students and staff to reach their full potential, I think my expertise and knowledge of the sector can continue to be of use to AMOSSHE. I have previously chaired NASMA (National Association of Student Money Advisers), worked for the Department of Education on student support policy, and led Student Services in three universities from different mission groups. I fully support the AMOSSHE Executive values and I am committed to ensuring that our practice and ways of working reflect and uphold our principles, without exception. Whilst on the Executive I have been involved with the AMOSSHE Insights research projects, led on specific policy areas and co-convened the 2017 winter conference. I will work to ensure that AMOSSHE continues to offer exciting opportunities to Student Services professionals and remains relevant to everyone who is part of this vital organisation. I have been on the AMOSSHE Executive since 2015 and have contributed to the continuing development of AMOSSHE’s influence in the higher education sector. I have worked on the website re-development, led on the benchmarking survey, represented AMOSSHE at various national meetings and committees and presented on behalf of AMOSSHE. I was fortunate to take part in the NASPA knowledge exchange to Colorado and co-wrote the report from that trip and disseminated the findings to members. I am currently Head of Student Services at York St John University where I manage a broad range of teams. My background is as a psychotherapist (I am a trained Cognitive Analytical Therapist) and I have worked at six UK higher education providers. 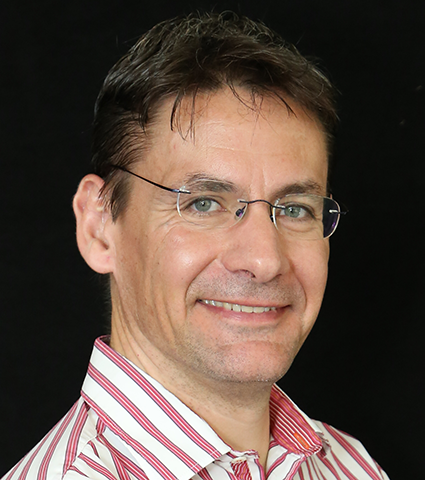 I also have experience of private sector work, having previously been Operations Director for CORE Information Management Systems, implementing software to measure therapeutic outcomes. I was a board member and trustee at Mental Wealth UK, and merged this student-led charity with another to form Student Minds. I am also a trained coach working on the Yorkshire Accord coaching programme. In a different context, I am a qualified football coach and manage a girls under-12s football team, which can bring its own challenges! Training and developing people is a theme that has run through my work and I would like to use these skills and experience to continue to ensure that AMOSSHE members can take part in relevant, stimulating continuing professional development. I believe I have demonstrated strong organisational skills, strategic vision and collaborative working in my leadership roles, and I take a very collaborative approach to leadership. I have already established a strong working relationship with AMOSSHE’s excellent National Office staff, and have experience in running AMOSSHE development events (I was lead for the past two successful events about duty of care and supporting trans students). Each of these events received excellent feedback and were structured to ensure participants had action points to take away so the learning could be applied in members’ institutions. I am committed to preparing a programme of timely and thought provoking continuing professional development opportunities for all AMOSSHE members across all the nations. I want to provide a broad range of high quality accessible events that focus on issues currently challenging members as well as forward thinking to issues that may emerge as the higher education landscape shifts. We know that the sector is a challenging one. Our students are experiencing increasing levels of mental health concerns, financial challenges and many other barriers to success and fair access. Furthermore, the ever changing social, political and economic landscape have led to new challenges such as TEF, REF, DSA cuts and the Prevent Duty. The support AMOSSHE provides to colleagues to help us to navigate our way through these challenges effectively within our institutions is invaluable. The core principles of AMOSSHE are very much aligned with my own personal values, and having the opportunity to contribute to AMOSSHE to support colleagues, shape organisational strategy and influence the sector and associated stakeholder groups, is a challenge I’m keen to commit my time, energy and experience to. 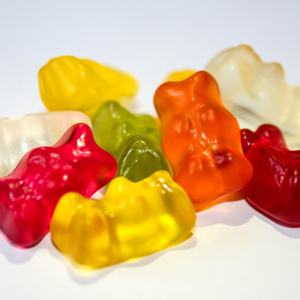 I have 15 years’ experience as a Student Services professional (within schools, Connexions Service, further and higher education), in roles ranging from front-line to leadership. I’m also a College Governor and Trustee of a charity. As well as being an active, participative member of AMOSSHE (Midlands group / continuing professional development events / national conferences / networking events) I have also volunteered my time and energy over the last seven years to help lead a non-funded national network (One-Stop-Shop network). Commitment, energy and an instinct for collaborative and partnership working. A passion and belief in the role of research and evidence-based practice in the design and delivery of services for students and the important part that AMOSSHE can play in supporting this agenda. A belief that AMOSSHE can be part of the evolution of Student Services in the UK, and play a key role in challenging the higher education sector’s traditional understanding of what Student Services is, and should be. Commitment to AMOSSHE being an inclusive, representative organisation that listens to its members and informs its members. I believe I make a considerable and valuable contribution to an association that l feel passionately about. To date, I have been privileged to serve on the Executive Committee, firstly as an Executive Member and more recently as Vice Chair (Operations). During this time, I have successfully contributed to all aspects of my elected roles, and taken the lead on several AMOSSHE projects. 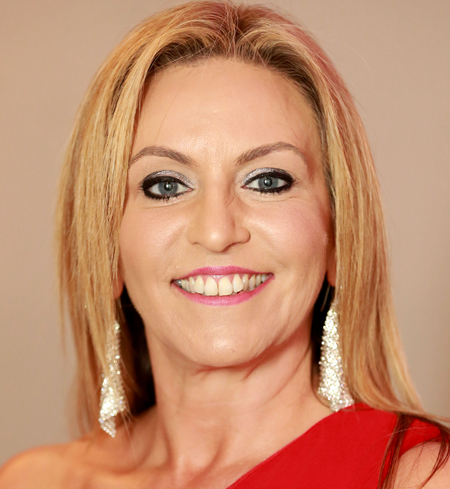 I play an active role in representing AMOSSHE on several national forums, I have presented nationally, and I have positively promoted our organisation and our members’ interests to stakeholders across the sector. Throughout all my dealings I maintain a professional approach, remain fully committed to championing the aims and objectives of AMOSSHE, and actively promote AMOSSHE as The Student Services Organisation. I have been instrumental in co-leading several extremely successful AMOSSHE national and winter conferences. These events have brought members together and enabled focused dialogue around the prevalent Student Services topics of our day. Furthermore, these events have provided a discussion platform whilst also positively contributing to the financial robustness of the organisation. I am delighted to again be co-leading on the upcoming AMOSSHE 2017 national conference. Over recent years I have had the pleasure of managing the National Office and the staff within it. This has included two relocations of our operations to better locations, overseeing a restructure and the increase of our staff base to its current configuration, which ensures that our members' needs are understood and met to the highest levels. I aim to build upon the hard work I have been doing, and continue to move AMOSSHE forward in what is undoubtedly a challenging time for all. I will continue to commit professional enthusiasm and expertise to engage and further the aims and objectives of all members and supporting student success. In the short time I have already been serving on the Executive, I have had the opportunity to help shape the continuing professional development programme for the year ahead, and to represent our members in national level policy discussions. I am excited to have the opportunity to dedicate more of my time and energy to these activities in the future. I will be a proactive, enthusiastic and dedicated colleague, committed not just to providing the voice of Scottish institutions but to representing the whole sector actively and professionally. I have recently been directing transformational changes in relation to the enhancement of the student experience, the establishment of an integrated Student Services Hub model, the creation of an institutional strategy for accessibility and inclusion, and the development of an institutional strategy and campaign aimed at preventing and tackling sexual violence. As a member of the AMOSSHE Executive, I will draw on this experience and utilise my network of partnerships to help develop a framework of support, guidance and resources that will benefit colleagues from institutions right across the sector. I am particularly keen in the coming months to develop strong, influential collaborations and build an increasingly robust sector-wide evidence base to influence policy makers, funders and partners to respond positively to the challenges that face Student Services across the UK, such as the demands arising from the increasing number of students with mental health conditions or presenting in crisis. I am driven, energetic, collaborative and motivated by progress, and I relish the chance to continue to work with the Executive team to deliver great results for our AMOSSHE network. I am Head of Student Support at the University of Leeds, responsible for the disability, mental health and wellbeing services along with international student support at the university. Alongside leading the teams delivering these services, my role involves enabling the wider university community to engage with the ways in which we all support our students to achieve their aims and ambitions to be successful after university, whatever they choose to do. I feel it is important that we maintain our membership-led approach, and I aim to contribute to the way in which AMOSSHE supports colleagues across the sector. I think that the collaborative working fostered by AMOSSHE is invaluable, and the further promotion of this, through national and regional events, is important. My work at Leeds involves connecting and coordinating the many elements of the university, which contributes to the success of our students. These partnerships are the key to the successful delivery of our services and I will seek to enable members of AMOSSHE to explore and engage with this partnership working. The continued success of the many AMOSSHE continuing professional development and networking events is also an important focus for me. Increasing the diversity of stakeholders who contribute to our sessions, through academic and related service leaders, will contribute to the development of a more holistic approach to the delivery of Student Services, against a backdrop of competing pressures and demands. I’m fully committed to the importance of AMOSSHE and passionate about the role it plays in supporting colleagues as they address the pressures and challenges facing Student Services. This June AMOSSHE member organisations in north west England hosted four Student Affairs professionals from the USA, representing NASPA, the US organisation for Student Affairs administrators in higher education. AMOSSHE and NASPA have a longstanding international exchange agreement for the purpose of mutual study of Student Affairs / Student Services models, practices and current student issues. Our NASPA guests were (left to right in the picture): Jennifer Forry (Interim Dean of Student Affairs, Newbury College), Byron McCrae (Vice President for Student Affairs & Dean of Students, Hampshire College), Kristin Kushmider (Dean of Students, University of Colorado Denver), and Debbie Conner (Vice President for Student Affairs, Coastal Carolina University). 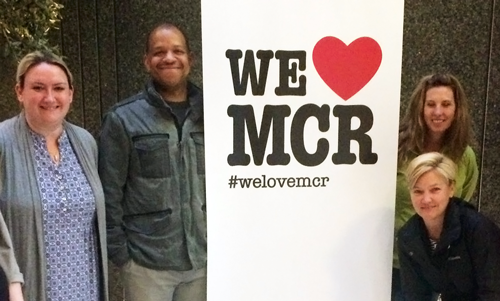 The delegates arrived in Manchester, and spent a week visiting Manchester Metropolitan University, University of Manchester, University of Chester, University of Liverpool, Liverpool John Moores University and Edge Hill University. As well as this, our visitors sampled some of north west England’s vibrant cultural scene. Many, many thanks to our members and colleagues who took time to welcome our NASPA guests and share expertise - and thank you to our NASPA colleagues for coming! Here's the AMOSSHE quarterly bulletin for spring 2017: a roundup of AMOSSHE news, events, and more (click image to view - PDF 2.9 MB). 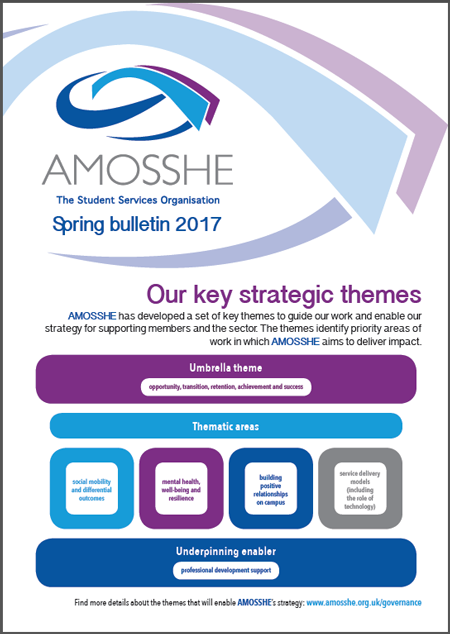 In this bulletin find out about the themes that AMOSSHE will use to enable our organisational strategy. Also, get an overview of our professional development work so far this year, and find out about our forthcoming exchange visit from Student Affairs professionals from the USA. The bulletin contains some of the key headlines from the AMOSSHE Student Services benchmarking survey 2016/17, which gives you a snapshot of the scale, scope, challenges and opportunities of Student Services in this academic year. The AMOSSHE national conference 360 degree thinking is all set to be an inspiring showcase for how Student Services leaders can really make a difference. Our final keynote speaker, Ben Smith, is joining us on Friday 7 July to share his insights into how one person can make a huge impact. 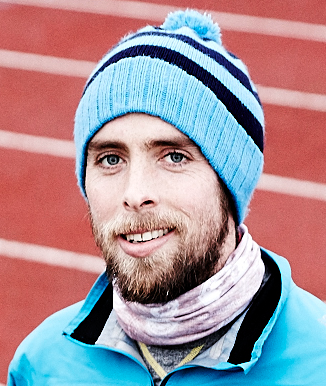 In 2015 Ben ran 401 marathons in 401 days around the UK to raise £250,000 for Kidscape and Stonewall, charities dedicated to tackling bullying in our society. Ben challenged himself to run the same distance as from London to Sydney to overcome the mental health issues, homophobia and bullying he had experienced in his life. His achievement has inspired others to do things they never thought were possible. Ben and The 401 Challenge team have received awards for this inspiring project, including the Regional and National Pride of Britain Fundraiser of the Year Award 2016, the Power of Light Award 2016 from the Cabinet Office and Prime Minister Theresa May, and the BBC Sports Personality of the Year Helen Rollason Award 2016. 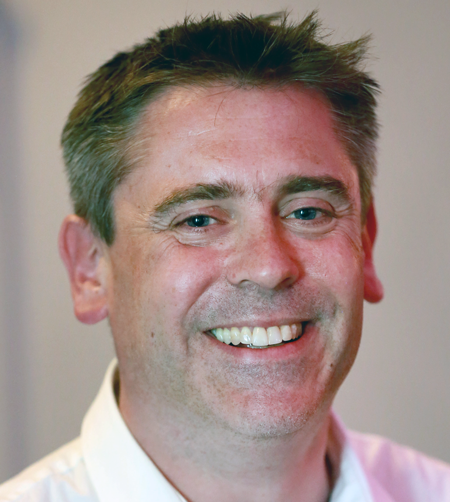 Ben joins our other keynote speakers Wes Streeting, Nicola Dandridge and Lee Elliot Major, to enhance our programme of AMOSSHE member- and sector-led sessions exploring all angles to drive student success – encompassing inspiring leadership, effective collaboration and innovative practice. Find out more about the conference programme: 360 degree thinking: leadership / collaboration / innovation. This event is AMOSSHE’s key professional development and networking opportunity this year, so don’t miss the opportunity to be there! Booking closes next week - Wednesday 26 April. 360 degree thinking takes place in Brighton from 5 to 7 July 2017. Book your place here. AMOSSHE is on the move! This month the AMOSSHE National Office is moving to a new home at Woburn House, Tavistock Square, London. We’re leasing our new office accommodation from Universities UK. This move represents a significant next step in AMOSSHE's development as an organisation and our role in representing our members at sector level. We believe that the move makes both strategic and practical sense by placing AMOSSHE physically and symbolically alongside other sector leadership organisations like Universities UK and GuildHE. It will both strengthen our relationships with these organisations, and mean that we have the opportunity to engage more directly and more often with a greater number of our members in person, because many members regularly visit Woburn House for sector events and meetings. The move follows many very positive years of sharing our office accommodation with the National Union of Students (NUS). AMOSSHE has benefited from a productive as well as enjoyable relationship with NUS during this time, which we aim to continue to enhance once we’re no longer neighbours. AMOSSHE would like to take this opportunity to thank NUS for their support and for helping us establish a permanent presence in London. The National Office phone number, email address and website URL will remain the same. 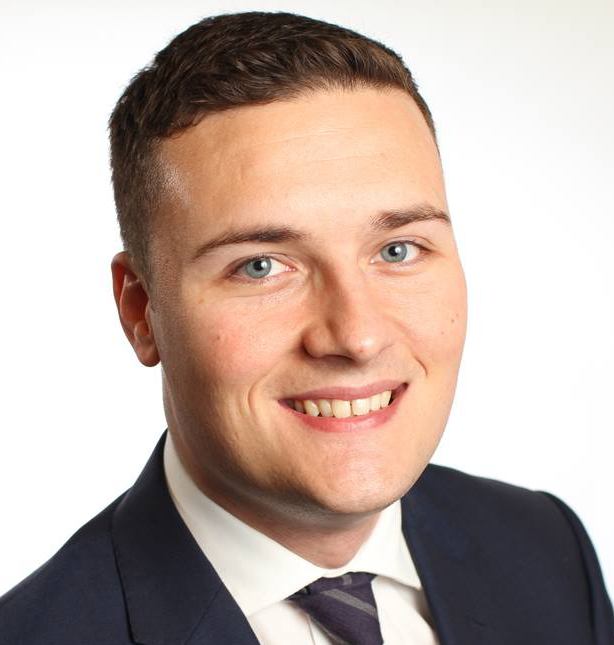 AMOSSHE is delighted to announce that Wes Streeting MP is the keynote speaker for day two of 360 degree thinking, the AMOSSHE national conference 2017. 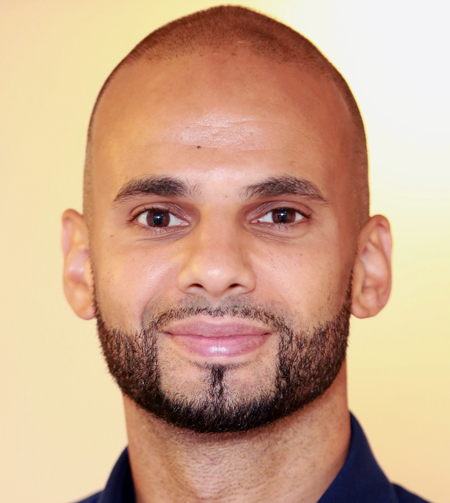 Wes was elected as the Labour MP for Ilford North at the 2015 general election. Having grown up on a council estate to become the first person in his family to go to university, Wes is passionate about improving access to education. He has worked on an anti-bullying campaign with schools across Britain, and run a national charity to support people from under-privileged backgrounds to get to university. Wes is a former President of the National Union of Students. Wes joins Lee Elliot Major (Chief Executive, Sutton Trust) and Nicola Dandridge (Chief Executive, Universities UK) as part of our exciting conference programme. 360 degree thinking approaches Student Services with perspectives from all angles to drive student success – encompassing inspiring leadership, effective collaboration and innovative practice. Take a look at the conference programme, venue and speakers: 360 degree thinking. 360 degree thinking takes place from 5 to 7 July 2017 at the Hilton Brighton Metropole, Brighton, UK. As a residential delegate you can secure a discounted early bird rate, and also sign up to take a sunset flight on British Airways i360, the world's tallest moving observation tower. But don't miss out! Early bird discounts end on Thursday 6 April. The current political climate in the UK and abroad has highlighted deep societal divisions about race, gender, class and religious identities. So as Student Services professionals it's a good time to ask ourselves: how do ideas of culture, social identity, power / privilege dynamics, unconscious bias and intercultural conflict influence our relationships with students and institutional colleagues? AMOSSHE is hosting a continuing professional development day to discuss these topics and find ways to start dialogues and build bridges. 'Understanding cultural differences to start dialogue and build bridges' takes place on 27 April 2017 at Woburn House, London. The day provides professional development and also training for trainers, including a resource guide with information about how to conduct similar sessions within your organisation. Find out more and book your place here: Understanding cultural differences. 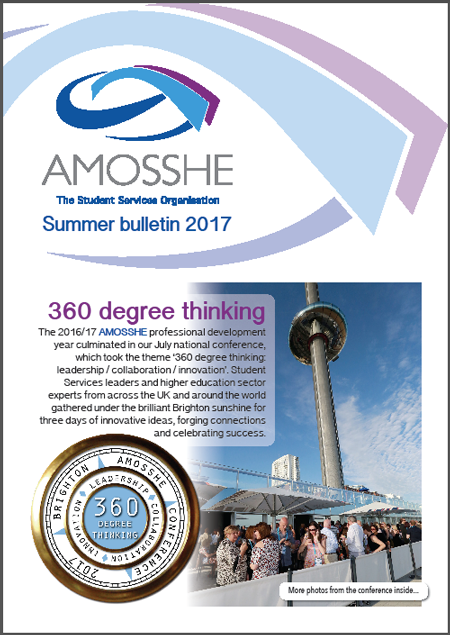 360 degree thinking: leadership / collaboration / innovation is the AMOSSHE national conference 2017. Let's take a 360 degree approach to Student Services, with perspectives from all angles to drive student success – encompassing inspiring leadership, effective collaboration and innovative practice. 360 degree thinking takes place from 5 to 7 July 2017 at the Hilton Brighton Metropole, UK. Join AMOSSHE down on the seafront in Brighton for three days of leading edge expertise-sharing by AMOSSHE members and sector organisations from around the world, as well as inspiring keynote speakers, networking and social opportunities. 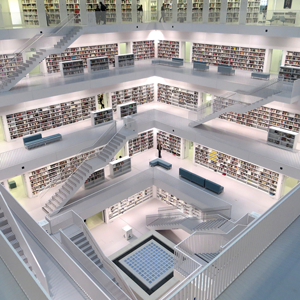 Take a look at the conference programme, venue and speakers: 360 degree thinking. 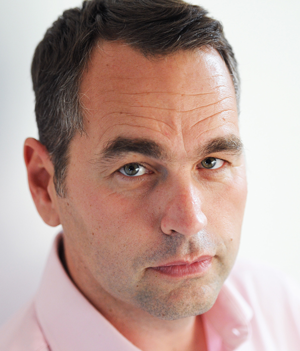 Lee Elliot Major is Chief Executive of the Sutton Trust, the UK's leading foundation improving social mobility through education. The Trust improves education opportunities for non-privileged young people through its programmes, and influences government policy through its independent research and advocacy work. Lee commissioned and co-authored the Sutton Trust / Education Endowment Foundation toolkit for schools, and is an adviser to the Office for Fair Access. 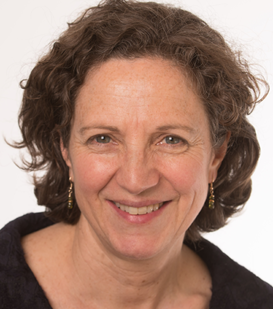 Nicola Dandridge is Chief Executive of Universities UK. Universities UK is the voice of universities, helping to maintain the world-leading strength of the UK university sector. 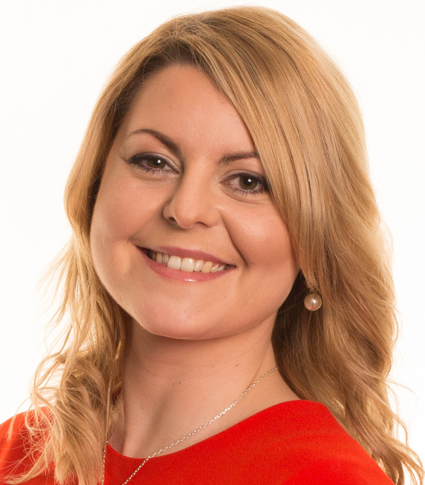 Nicola is responsible for the leadership and management of Universities UK. She was previously Chief Executive of the Equality Challenge Unit, and practiced law in both England and Scotland. We have more exciting keynote speakers to announce for the rest of the conference, so watch this space. It's worth booking early! As a residential delegate you can secure a discounted early bird rate, and also sign up to take a sunset flight on British Airways i360, the world's tallest moving observation tower!